Alpha coming this weekend; early access confirmed for the future. 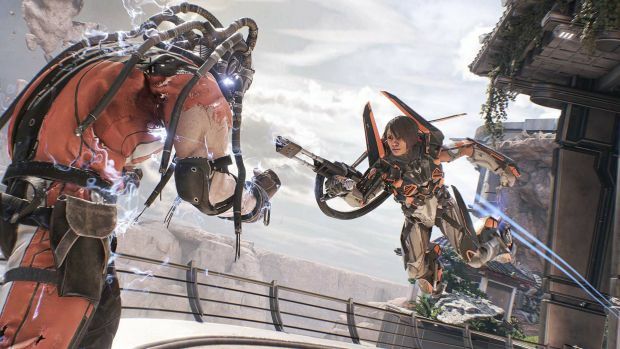 Boss Key Productions’ LawBreakers received some new footage at the PC Gaming Show, showcasing the new map Promenade, and Cliff Bleszinski took the stage to talk about the movement that the game incorporates. LawBreakers will take after Unreal Tournament and Tribes – the bunny hopping will be familiar to arena shooter fans but with the addition of zero gravity, momentum and unique character abilities. Balancing the different abilities hasn’t been easy (Bleszinski outright admitted that it was completely unbalanced) but that’s what the upcoming alpha is looking to fix. How will LawBreakers deal with similar games like Overwatch? Bleszinski wants LawBreakers to be the Mortal Kombat to Overwatch’s Street Fighter, returning to the roots of the shooter and having a little blood to go with the combat. The alpha will kick off on June 18th but you can pre-load it on June 16th if you sign up (and are accepted). Early access will also be coming in the near future. Stay tuned for more details as they arrive.